I love making these flowers (I know – surprise, surprise). But they really add something special to a project! They’re a leeeetle bit tricky to get into an envelope, but I’ve even mailed them using a larger padded envelope (#116911, #2.95 for 3). This was a hand-delivered card, so I put it in a Medium envelope and gently closed the flap. I really love that Creative Elements stamp set too. It always seems to supply the right image when I’m looking for something…you know, that kind of looking when you don’t know WHAT you’re looking for but you know you’ll recognize it when you find it? That kind of looking. The paper in this flower has been mashed into a completely new substance. It almost feels like raw silk when I’m done mashing it. Once I get it like that, I mist it with the Champagne Spray until it’s pretty damp, then shape it and set it aside to dry. When it’s dry, it stiffens up a bit and holds its shape. I don’t know how that works, I just know it happens. 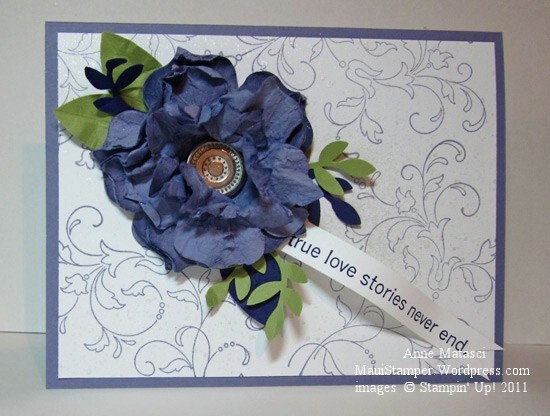 I think all the cards you make are beautiful, but I my favorite ones are the ones with “mashed” flowers.